【Safer And Better Quality】: This scrubber is made of flexible and durable food-grade silicone. BPA free, FDA-approved and LFGB standard. Totally free from chemical material. It can directly touch our food or dish. Rest assured that you can use it to wash fruit and vegetable. 【Your Perfect New Year Present】:You can use this to brush pot, plate, bowl can also be used to wash fruit, vegetables. Even you can use it for shower.As the insulation pad more features waiting for you to find. 【Use More Convenient】: Owing to its superior material, it is much more durable. Non-abrasive and gentle so it never scratches. Lots of tiny silicone bristles work to loosen and clean stuck on grime. It will bend and flex to get deep inside glasses and corners. 【Easier To Clean】: Use this Household Cleaning Sponges to replace your old style brush for improving kitchen hygiene. Super easy to clean the brush, just rinse with water or put it in the dishwasher, it will has no residue. Sterilization more secure.Protect the health of you and your family. 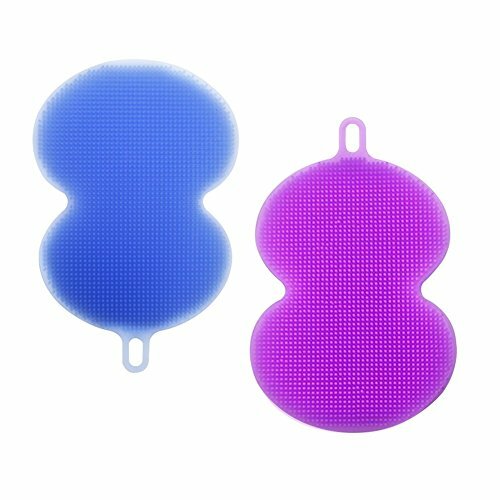 ☕️【Different from traditional sponge】:This silicone scrubber is bacteria and mildew resistant. It seems that the common sponge is easy to get mildew then give out bad smell. Because sponge absorb dirty water and grow bacteria. However, our scrubber puts an end to these problems.